You spend hours at your job, but it’s not helping you feel fulfilled. Consider a career in the construction industry. Explore the immediate openings and get on-site training, great starting pay, and potential for growth. It's your life. Do something that makes you happy. Today, with more than 9 million employees, the construction industry is a growing industry with a vibrant workforce. But there is a labor shortage that remains a massive problem for those hiring. In fact, more than 80% of contractors report they can’t find the skilled workers they need. If you're ready for a career change, consider a path in construction. Seven of the top 10 industries with the highest growth are related to construction. That means plenty of job availability and long-term stability. Source: The 10 Fastest-Growing Industries In The U.S., Forbes, 2017. Step on the jobsite and start gaining applicable experience. Installers can make up to $70K and if you start your own business, you can earn six figures. Source: Siding Installer Salary, Payscale.com, 2018. Sitting at a desk can cause actual harm to your health. Installing vinyl siding is easier on your body than other construction jobs and can help keep you active. It’s time to develop an entirely new set of skills to advance your career. Go in with an open mind and start learning directly from the pros on the job site. Source: salaryexpert.com, Siding Installer Salary, 2018. If you have basic knowledge around tools and handy work, you can apply for a vinyl siding installation job and get started ASAP! 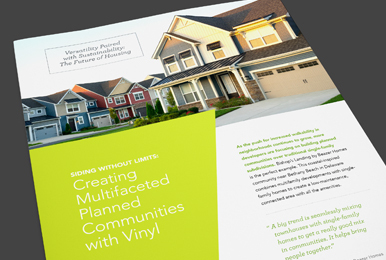 Vinyl siding is one of the easiest products to install so you can get started ASAP. From formal educational programs to on-the-job training, there are many opportunities to gain experience to help you get a job right away. Consider hitting the books for a degree in construction management or the trades. Earning additional merits can help you climb the ladder and even start your own business. Learn applicable skills through an apprenticeship program. You’ll get jobsite experience mixed with classroom instruction to help you get fully prepared and qualified for a career in construction. Many installers begin their careers as helpers, learning everything they need to know directly from pros on the job. Plus, since vinyl siding is the easiest product to learn and install, you don’t need experience to get started. Search these recommended job boards for vinyl siding installer jobs in your area and start applying for these openings. Many provide training on-the-job and don’t require previous experience so you can get started right now.